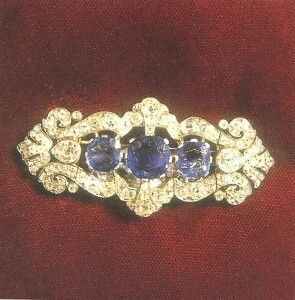 Three flawless sapphires are set on this heavy steel belt, shining almost too faintly to notice. These belts are valued by incarnates and other meldshapers, because they can temporarily supercharge one or more of your soulmelds or other essentia receptacles (see Magic of Incarnum for details on incarnum). An essentia belt has 9 charges, which are renewed each day at dawn. Spending 1 or more charges maximizes the essentia investment in one or more of your soulmelds or other essentia receptacles (as chosen by you when you activate it) for 1 round. Effectively, the belt temporarily adds essentia to the affected receptacles (soulmelds, incarnum feats, magic items, and so on) until it reaches its maximum. While this ability is in effect, you can’t reallocate essentia from the affected receptacle. 1 charge: Maximizes essentia investment in one receptacle. 2 charges: Maximizes essentia investmentn two receptacles. 3 charges: Maximizes essentia investment in three receptacles. Prerequisites: Craft Wondrous Item, essentia pool, meldshaper.